My kitchen counter has a small desk area with a drawer, which I always kept reasonably tidy, not letting it degenerate into junk-drawer infamy. I kept a road atlas at the back and a few small notepads and pens at the front. The road atlas has been obsolete for a long time because we get directions from OnStar when we go on road trips, instead of using paper maps. I was wondering just how old it was; and when I opened the drawer to check, I discovered that a lot of other stuff had been put in there when I wasn’t looking. 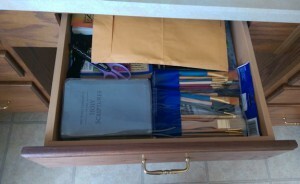 Among other random things, the drawer now contains a set of paintbrushes, some paper-edging shears, a Bible, and a book of crossword puzzles. 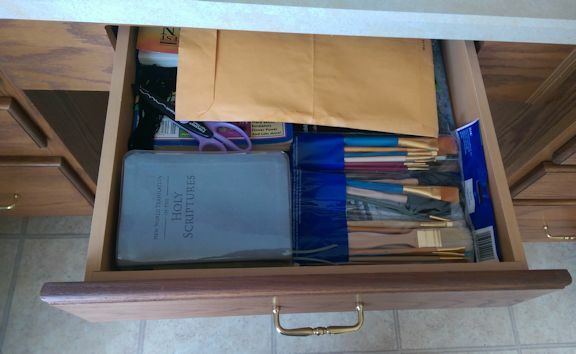 While it’s good that my daughter has been exercising her creativity and reading Scripture, and there doesn’t appear to be much in the drawer that would qualify as actual junk, I have to say more careful attention to organization would be appreciated! Yes, I got rid of some old local maps last year, but the atlas still hung around.